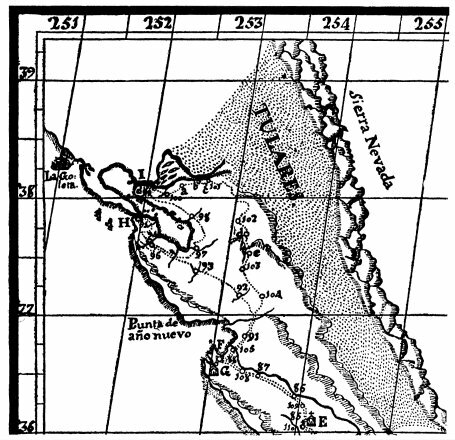 The earliest approaches to California were from the sea; consequently the regions along the coast were the first to become known to the civilized world and to receive names. In 1542 Juan Rodriguez Cabrillo, while off the peninsula of San Francisco on November 18, beheld the Santa Cruz Mountains covered with snow and named them Sierras Nevadas. 1 On a map of 1564 by Ortelius the name Sierra Nevada appears near the coast but farther north, due to an error in description. As more specific names came to be applied to the coast mountains, it is not surprising to find this common general name moving farther and farther into the interior to designate in a vague way some less familiar range. The interior of California was rarely visited by the Spaniards until the nineteenth century, but there were one or two expeditions that led towards a knowledge of the Sierra Nevada, and on one of these the name became affixed to the range where it now rests. Commandarde Pedro Fages crossed the Coast Range at some point south of San Lun Obispo in 1773 and beheld the Tulare Valley; 2 and in 1776, Padre Francisco Garcés entered the Tulare Valley, probably by way of the Tejon Pass, crowd the Kern River, and visited several Indian rancherias. He beheld the Sierra Nevada, which he called Sierra de San Marcos, and in his journal, 3 and on Padre Pedro Font’s map of the same date, the relation of the Sierra to the Tulares and the Coast Range is well defined. Notwithstanding Garcés and the Font map, the name Sierra Nevada continued to wander, As late as 1841 Commander Charles Wilkes, U. S. N., called the inner part of the Coast Range east of San Juan, the Sierra; while the mountains beyond the great interior valley were known as the Californian Range. 4 just when the name Sierra Nevada finally became fixed would be hard to say. 1 Bolton: Spanish Exploration in the Southwest, 1916, quoted in Chapman’s History of California, 1921, p. 79. 2 Bancroft: California I, p. 197. 3 Coues: On the Trail of a Spanish Pioneer, 1900, I, p. 291. 4 Wilkes: Narrative of the U. S. Exploring Expedition, 1852, II, pp. 232-233.